DEAR BULLY | Join us in this safe space online to share ideas on how to put an end to bullying. Learn what you can do to help give a voice to those who cannot or are too afraid to be heard. The most ridiculous advice ever! 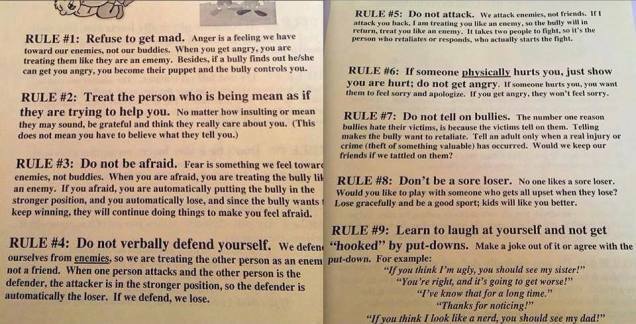 Jezebel.com obtained a flyer sent home to 5th grade students in Lincoln, Nebraska on how to deal with bullies. These “rules” include the worst pieces of advice on how to handle bullying that we’ve ever seen. “Rule #2 Treat the person who is being mean as if they are trying to help you” What?! “Rule #7 Do not tell on bullies.” Did a bully actually write these so-called “rules”? We are hoping that the parents of the children at Zeman Elementary School have a nice long talk with their kids to undo the damage that this flyer could potentially have caused. A new app spearheaded by the WNBA’s Brittney Griner called BG:BU is a mobile app encouraging empowerment, strength and creativity for youth who are bullied as well as allies in the fight to end bullying. Click here to join the fight. 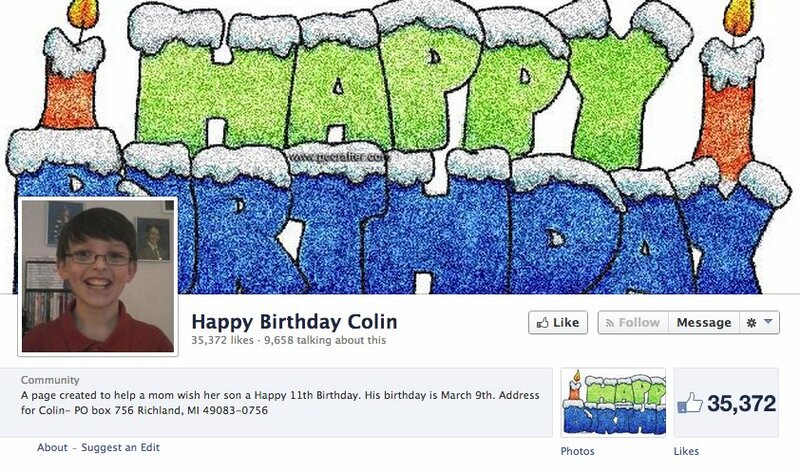 If only all kids who thought they didn’t have friends could have a birthday celebration like this. Check out this great video done in a Massachusetts’ school. What a wonderful way of showing how standing together can combat bullying. Stand up, don’t stand by! Great message! Want to know how to prevent your kid from being bullied? Read this. I get asked all the time, “What can I do to prevent my child from being bullied?” You need to build up your child to the point where bullies’ words and taunts fall on deaf ears. You need to make your child’s self-esteem indestructible. You need to NOT break your own child. Read more in this brilliant post by Dan Pearce about building a better kid. Celebrity Makeup Blogger Kandee Johnson delivers a beautiful and inspiring way of dealing with people who bully and use hateful words to bring people down. She shares her love for her followers and lets them know that they are beautiful, strong and loved. A victim of bullying herself, Kandee has joined the Love is Louder campaign. For more information on the Love is Louder campaign, click here. For Kandee Johnson’s YouTube channel, click here. A note to readers: I planned on making this essay funny. I thought I’d write a sarcastic, amusing letter to a former bully or the girl who made me feel crappy in eighth grade. I am funny. Really. My novels are filled with wry humor and wit. And yet, when I sat down to write about this particular incident, funny isn’t what came out. Say it’s sixth or seventh grade and say you’re one of those girls who is not quite in one group and not quite in another. You can’t be categorized. You don’t know this at the time, but some girls find this a problem. People like to have you fit neatly into one social heading: alpha girls, bookish girls, poor girls. You—h happily—float from one group to the next. This means that while you are welcome in all the groups, you are integral to none of them. No one waits for you to go to lunch. No one feels their party is incomplete without you. On the other hand, you always have a place to sit and can chat equally well with B about her new hair cut and crush on A or S about her parents’ divorce or C about writing stories, which you both love to do. When X announces her sleepover, you can’t wait to attend. There will be laughter way late at night, food tucked into bathrobes, dares and truths about boys, private jokes to reference the following Monday. But then you can’t make it. Not because you don’t want to—nothing sounds better than sitting with your knees tucked to your chin while X braids your hair or asks who you like. But you’ve got a high fever, a serious infection—again—and wind up missing not only the sleepover but the whole following week of school. When you enter the classroom on Monday morning, hang up your red book bag on its metal hook, you see W and wave, looking forward to hearing every details of the sleepover jokes and conversations you missed. But W turns away from you. So do K and B. In fact, no one will make eye contact with you, and when you decide it’s not just your imagination, you approach E and B and say, “Hey, what’s going on?” they turn away. You experience the same feelings as watching the scary movies everyone else loves but you hate: chills, rapid heartbeat, dry mouth, fear, that sickening pull in your gut. You try again, just to talk to someone. Anyone. But even the people who have no one to talk to—the girl who doesn’t wash her hair, the boy who still picks his nose—they won’t speak to you. You ask what she means. This is what happened when you were away. You missed the sleepover and W moved in for the kill. You never realized she was jockeying for some social position, or how it’s always a game, even if you chose not to play it. So W writes a document, forms a club called the I Hate [Your Name Here] club. Like all clubs, it has focus, a sole goal: hating you. She works on it the whole week and convinces some kids easily. They are eager to please W and sign without question. Others take work—W has to persuade them, make them long to be part of the majority of haters, woo them with campaign promises. She is the president of the club. But there are those who will not be so easily conned or swayed. For them, W offers them to the chance to just be in the band. It’s like a lesser form of hating. You just sing the club’s theme song. But still, you can’t speak to the subject. S is the only person in the entire grade who joins neither the band nor the club. I could tell you how this is all real, how hellish it was, how alone I felt, or how I rallied. I called W’s second-in-command and when she hung up on me, I went right to her mother. Once I involved the parents, the club crumbled, but the damages were never addressed, just absorbed into everyday life. We should have talked about it. We should have all spoken with teachers and parents. I never did. I tell this story to my own children so that they will tell me, so they will speak. But mainly, I tell my children so that they will be like S and stand up—though standing up is difficult and sometimes dangerous. I tell my children this because it is easy to pass it off as a funny incident that happened a long time ago. I tell them now because as a parent I am amazed at how quick people are to say “Well, girls are mean at that age” or “Everyone does stuff like that at one point or another” or “I wouldn’t go back to that age if you paid me a million dollars.” Where do you draw the line between not being nice and being cruel? At what point is it unacceptable? How threatened can you feel going to school each day? I tell this story now because it should have been told then. Because out of a class of sixty people, only one of was by my side. Only one said no. Emily Franklin is the author of over a dozen books for teens, including two critically-acclaimed series, The Principles of Love and The Other Half of Me. Emily’s other young adult titles include the novels in the Chalet Girls series, and the forthcoming Half-Life of Planets. She has also written two novels for adults, Liner Notes and The Girls’ Almanac. She also edited the anthologies It’s a Wonderful Lie: 26 Truths about Life in Your Twenties and How to Spell Chanukah: 18 Writers on 8 Nights of Lights. Check out her website at www.emilyfranklin.com.